Looking to buy an Autel Scanner? The company makes some of the best OBD2 scanners available on the market today. It’s safe to say that you can’t go wrong with an Autel scanner. But out of them all, what is the best one? But out of them all, what is the best one? Today I will introduce top Autel scanners review on the market in 2019. Autel scanner for professionals particularly those who work on heavy-duty vehicles like trucks, buses, and vans. 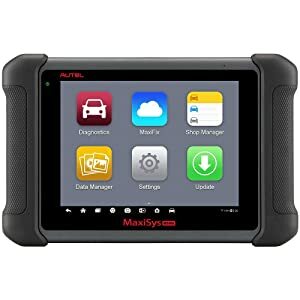 If you’re looking for a scanner that can troubleshoot system problems in heavy-duty vehicles then look no further than the Maxysis MS908CV. 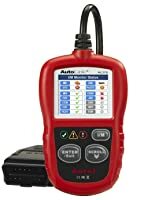 This Autel scanner comes with all the connectors for heavy-duty vehicles. Works on OBD1 and OBD2 heavy-duty vehicles. They include trucks, vans, and buses. 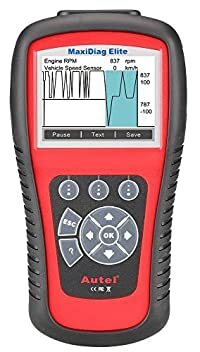 Apart from reading and clearing codes, the MS908CV supports oil reset, brake bleeding, EPB, DPF, IMMO key programming, injector throttle and many more. 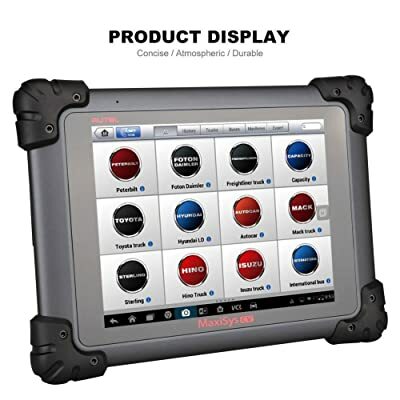 It also covers special functions like adaptations, calibration, injector quantity adjustment and DPF regeneration. The scan tool features Bluetooth for wireless connectivity while you are working. It also has Wi-Fi for internet access. You can go online and get diagnostic and repair tips or update its software. With a tablet-like body, the MS908CV weighs just 21.4 pounds and measures 25.5 x 17 x 7.5 inches. It is fitted with a 9.7-inch LED touchscreen that makes navigation a piece of cake. Even better, the whole device is coated with a grease-resistant material. So you won’t have to worry about grease when you’re working. Supports all OBD functions for heavy-duty vehicles. Features wireless connectivity for mobility as you work. Autel offers 24/7 customer support for buyers of this device. Free software updates last for only one year and then you will have to pay for future updates. Pretty expensive, especially for non-professionals. This is undoubtedly meant for professionals. Particularly those who work on heavy-duty vehicles like trucks, buses, and vans. Autel designed the features to suit just that. Autel’s MD802 Maxidiag is one of the few scan tools that actually perform deep system troubleshooting. Other than electronic systems like an engine, transmission, airbag, and ABS, this Autel scanner also covers chassis, body and powertrain. With such functionality, you’d be forgiven for mistaking it for a professional scan tool. In actual sense, you don’t need professional knowledge to use it. It’s actually simple and straightforward. Works on all mainstream made of cars made in America, Europe, and Asia. However, it is strictly an OBD2 scanner. Meaning the car should be a 1996 or newer model. It does a full system diagnosis that involves reading and clearing trouble codes for the engine (Check Engine Light), ABS, SRS, and transmission. In addition to that, the scanner supports special test modes. They include O2 monitor tests, component test, onboard monitor test, oil reset test and I/M readiness test. It provides live data, freezes frame data and also retrieves vehicle information. While this Autel scanner does not support wireless connections, it can connect to a PC. There’s a USB cable that comes with the package. It is meant to help you access the internet via your PC and update the device’s software. The total weight of Maxidag MD802 is just one pound. Its dimensions are 14.6 x 3.9 x 8.7. That’s small enough to be handheld or stored in a toolbox or driver’s compartment. This scanner is perfect for DIY technicians and auto enthusiasts. You can do all OBD2 systems diagnoses, run all test modes and perform reset functions. That’s definitely more than a beginner needs, but for a DIY technician, those are necessary functions. A fast and effective scanner for beginners and ordinary car owners. 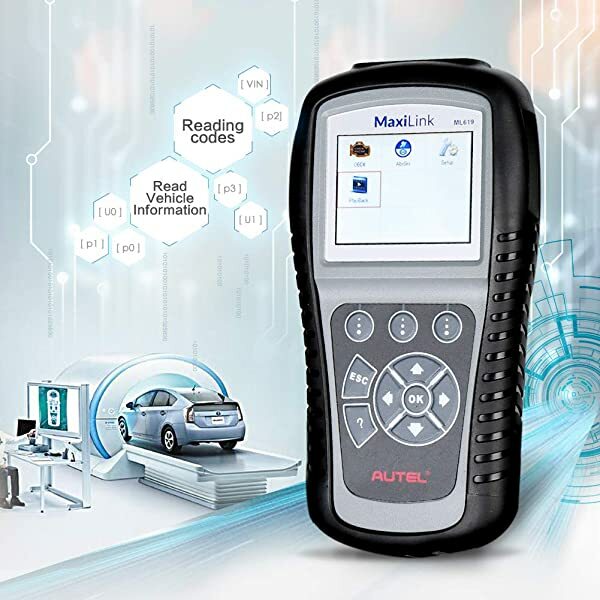 A fast and effective scanner, the MaxiLink ML619 is everything you need if you are relatively new to OBD2 diagnostics. It doesn’t require professional knowledge to operate. In fact, this Autel scanner is a plug-and-play device. It will start scanning your car’s system as soon as you plug it into the OBD2 port. Compatible with American, European and Asian OBD2 vehicles. That includes virtually all mainstream vehicle brands made from 1996 to date. If your car is a Chrysler made before 2002 you will need to buy a special connector. Otherwise, the scan tool will not troubleshoot SRS. First, the MaxiLink ML619 reads and clears generic, manufacturer specific and pending codes. That goes for three main systems, namely the engine, ABS, and SRS. Simply put, you can use this Autel scanner to turn off the Check Engine Light and also diagnose ABS and SRS. Additionally, the device does I/M readiness tests. It also supports playbacks, graph data, freeze frame data, and live data stream of PCM and sensors. You can print diagnostic data via PC. Included in the package is a USB cable for linking the ML619 to a computer. Other than using the connection to print diagnostic data, you can also log into the internet using a computer and upgrade the scanner’s software. The fitted TFT display makes it very easy to access this scanner’s menus. In addition to that is a built-in speaker that gives audio notifications for I/M tests. Actually, the device features a dedicated one-click I/M readiness key. the device does I/M readiness tests. It also supports playbacks, graph data, freeze frame data, and live data stream of PCM and sensors. You can print diagnostic data via PC. Free online updates for the lifetime of the scanner. Supports all mainstream OBD2 compatible vehicle brands. Provides a brief definition of codes. A bit lacking for professionals who operate auto shops. This Autel scanner is for beginners and ordinary car owners. It is an intermediate-level tool that gives you some handy extra features other than reading and clearing codes. But again, it is very easy to use and doesn’t require expert knowledge. A revolutionary Autel scanner for DIY technicians. Compared to its predecessor (MaxiDiag MD802), the MD808 is a revolutionary Autel scanner for DIY technicians. It actually qualifies as a service tool on account of the handy features it has to offer. This Autel scanner is an OBD2 diagnostic device. Therefore it works on all mainstream brand vehicles manufactured from 1996 to date. 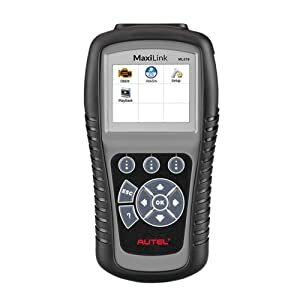 The Autel MaxiDiag MD808 offers both basic and advanced diagnostic functions. On the basic front, the device troubleshoots the four primary systems of a vehicle. They are an engine, ABS, SRS, and transmission. With regards to advanced functions, you can use it for an oil reset, SAS, BMS, EPB, and DPF. 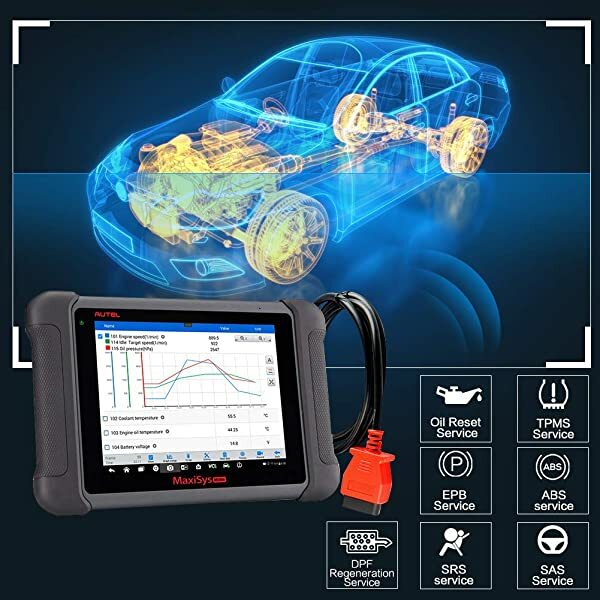 In short, this Autel scanner covers virtually every basic OBD2 diagnosis as well as additional tests that enhance a car’s performance. Although the scanner doesn’t support a direct USB connection to a PC, it does come with an SD card. You can download updates from a PC to the SD card, and when you insert the card this device will automatically load the updates. 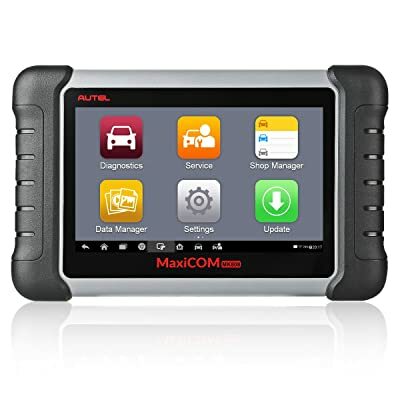 Besides the rugged and attractive design, the Autel MaxiDiag MD808 features a full-color screen that measures 4 inches. The 800 x 480 screen makes navigation through menus pretty easy. The whole device measures 13 x 9.9 x 3.9 inches and weighs 3.55 pounds. That’s a perfect size for portability and easy storage. Comes complete with a user manual, OBD cable, SD card, carry case and user manual. Offers basic as well as advanced OBD2 diagnosis functions. Doesn’t have a built-in battery so you have to connect it to a car before it powers on. Autel US doesn’t offer support for buyers of this tool. You will have to contact distributors for purchase-related help. If you are a DIY technician you will love this scanner. It offers just enough functions to give you access to the main systems of a vehicle. Not too complicated to require professional knowledge but not too limited in scope for a DIY person with intermediate diagnostic know-how. Yet another reliable entry-level scanning device from Autel. While the TS401 doesn’t read and clear codes, it pinpoints faults related to TPMS sensors. As you might expect, the TPMS plays a huge role in on-road safety. Keeping it fault-free will go a long way in ensuring that you are safe. The Autel TS401 is a dedicated device for that. This Autel scanner works on ALL vehicles that are TPMS-enabled. It covers domestic as well as Asian and European models. The device resets the TPMS and turns off its lights. Note that it is not a code reader. Meaning you can’t use it to read or clear TPMS codes. That said, it diagnoses and reports TPMS faults. After the problem is fixed its status will change from “current’ to “historical”. And of course, the TPMS will continue to work normally. As part of its diagnosis, this Autel scanner reads TPMS sensor ID, tire pressure, sensor battery condition and tire temperature. Additionally, it supports programming of OE sensors when you need to replace OEM sensors. 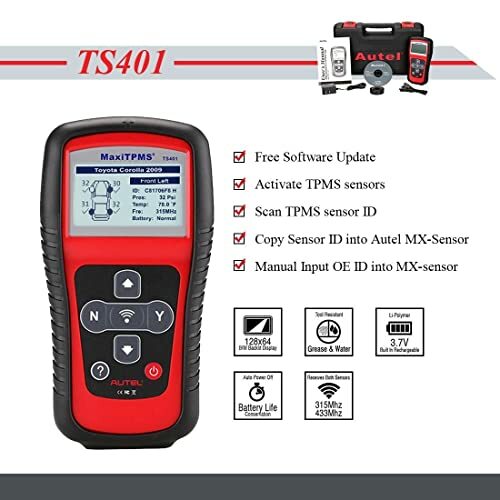 The Autel TS401 MaxiTPMS is a Windows-based diagnostic tool. It links with Windows XP and later versions, which allows you to update the device’s software. Although this Autel scanner is not compatible with Mac, it really is a stand-alone device. You only need a PC when updating the software. Perhaps one of the best things about the TS401 is its graphical display. You get a step-by-step guide on how to do TPMS diagnosis on the device’s color screen. The total weight is a mere 3.31 pounds. Combined with dimensions of 15 x 3.5 x 11.4 inches, the light weight makes it one very compact and portable Autel scanner. A dedicated device for diagnosing TPMS sensors. Very reliable support from Autel, both via call and email. Not a code reader or scan tool, therefore, you can use it to diagnose other systems like ABS or airbag. Only compatible with Windows, not Mac. The TS401 is made for ordinary car owners. If you are a car owner you definitely want maximum safety guaranteed by a proper TPMS. Having this Autel scanner will help you diagnose the system as frequently as you need to ensure it is faultless. Professional technicians may find it lacking in functional scope. It probably doesn’t make a lot of sense to purchase a scanner that only performs one function. Built with a quad-core, 1.8HGz NVIDIA Tegra processor, the Autel MaxiSYS is one very fast scan tool. It only takes 20 seconds to boot up and start scanning a vehicle for faults. And while that may be a big selling point, it’s not even the best thing about this Autel scanner. It works on over 80 US, Asian and European made vehicle brands. Although it is primarily an OBD2 scanner, you can get OBD1 adapters as well. In short, this scan tool covers virtually all types of vehicles. 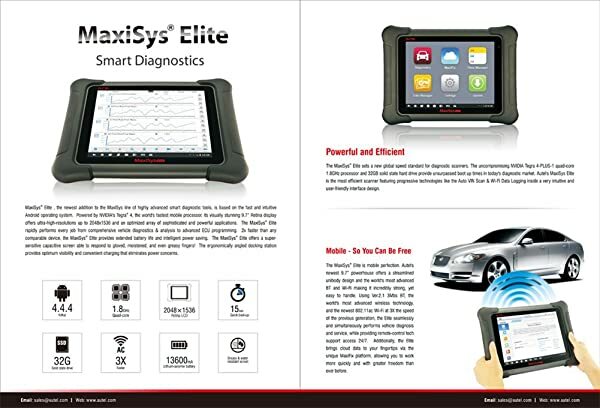 As a professional-grade scan tool, the MaxiSYS Elite supports all OBD2 functions. It can read/clear codes and run functional tests for all onboard vehicle systems. They include the ABS, brake system, emissions system, engine, fuel system, lights, SRS, and transmission just to name a few. Beyond that, this Autel scanner also supports advanced diagnostic functions. 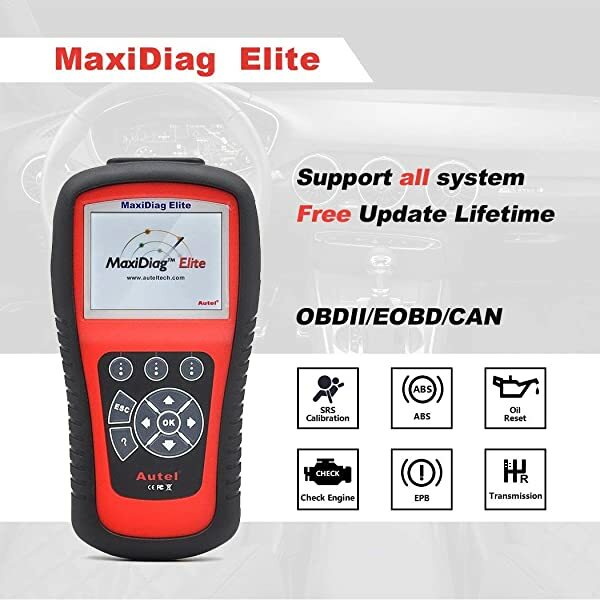 You can use it for ECU coding, anti-theft matching, SAS reset, tire pressure reset, injector programming, throttle matching, and DPF reset among several other advanced functions. With its Bluetooth module, you can connect it wirelessly to a car’s systems and run tests without cables constantly hindering your mobility. Additionally, the scanner features Wi-Fi for accessing the internet. Besides updating the software, internet access provides a ton of diagnostic and repair resources from online sources. Its highly interactive menus are easily accessible thanks to the fitted 9.7-inch display unit. The whole gadget measures 25.6 x 7.5 x 16.9 inches and weighs 24.9 pounds. 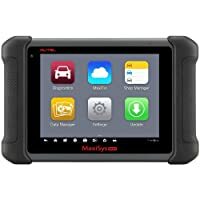 As a professional-grade scan tool, the MaxiSYS Elite supports all OBD2 functions. It can read/clear codes and run functional tests for all onboard vehicle systems. Updates software automatically via the internet. Comes with 24/7 tech support from Autel. Also allows access to MaxiFix where you can get tons of diagnostic and repair guides from professionals. Features a comprehensive data management application and data logging sessions for storing vehicle info. Excellent in construction as well as performance. Price is on the higher side. Probably not affordable to beginners, average car owners, and some DIY technicians. It is definitely for professional mechanics and auto shop owners. The superior data management application means you can store and retrieve customer information very easily. Additionally, the scanner supports all OBD functions and works on all mainstream vehicle models. There’s no chance that it will fail to diagnose any car that a customer brings. The MaxiSYS MS906 is a massive upgrade from its predecessor, the MaxiDAS DS708. 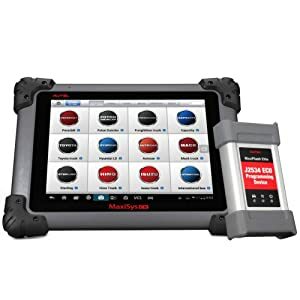 While the latter lacked some features like Wi-Fi, touchscreen, tablet design, immobilizer key programming and data logging, the MS906 has them all. This scan tool runs on an Android operating system. Plus it is fitted with an A9, 1.40 GHz quad-core processor. That’s a lot more power than you will get in most other professional scan tools. Additionally, this Autel scanner performs more specialized functions that involve adaptation and matching. 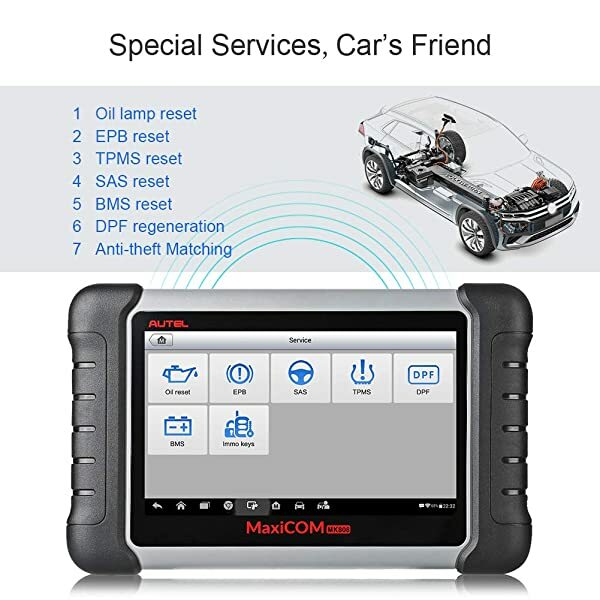 Actually, it has a dedicated service section for an oil reset, EPB, SAS, DPF, BMS, ABS bleeding, TPMS, IMMO (programming of keys or anti-theft matching). This scanner connects to the internet using Wi-Fi. That’s why it’s very simple to update. Alternatively, you can connect it to a PC using a USB cable (included). That way you’ll even be able to print diagnostic info. Navigating the MaxiSYS MS906 is pretty simple thanks to its 8-inch LED touchscreen. Also, it features a one-touch access to menus, which makes the whole device very intuitive. This scanner connects to the internet using Wi-Fi. That’s why it’s very simple to update. Alternatively, you can connect it to a PC using a USB cable (included). The total weight is 22 pounds and the dimensions are 10 x 1.4 x 6.9 inches. In short, the scanner is well-sized for easy portability and storage. Features an 8-megapixel camera with a flashlight. Comes with a 12-month warranty and free online updates. The built-in 5000mAh lithium polymer battery allows 4.5 hours of continuous use without recharging. Very powerful thanks to the Android OS and a quad-core processor. It doesn’t support relearning of certain parts and systems like TPM sensors. But it does test them. Fairly expensive if you are not a professional mechanic. This is an awesome scanner for technicians who are just starting. Although it packs several high-end features, the device is very intuitive and simple to use. There are no complicated functions that may confuse you. 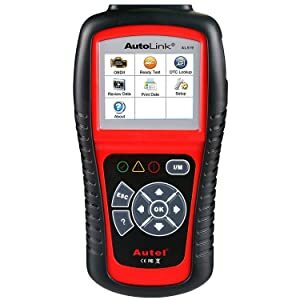 This Autel scanner will help you determine whatever is triggering the Check Engine Light. It gives DTCs and also provides definitions for each. Additionally, the device has a huge library of troubleshooting tips for diagnosis and also repair. Supports all the 10 OBD2 modes. That means the AL519 works on all vehicles manufactured in 1996 or later. Actually, it covers the US, European and Asian made vehicles. The Autel AL519 primarily turns off the Check Engine Light. It does so by reading and clearing generic, manufacturer-specific and pending engine codes. You can choose to either view the sensor data live or record it. Besides that, this Autel scanner features the convenient one-click I/M readiness check. With just one push of a button, you can do a quick test of state emissions readiness, drive cycle verification and O2 sensor test. Other than freeze frame data, the AL519 also displays vehicle information (VIN, CIN and CVN). When you purchase this Autel scanner it comes with a USB cable for connecting the device to a PC. The connection not only allows for printing of diagnostics info but also makes it possible to update the scanner’s software. Undoubtedly one of the most compact units from Autel, the AL519 measures a mere 7.83 x 4.11 x 1.48 inches and weighs just 2.05 pounds. Operating it is quite simple thanks to the interactive menus. You can access them via the color TFT screen (320 by 240 dpi). The fitted LEDs and built-in speaker provide audio-visual notifications during I/M readiness tests. The Autel AL519 primarily turns off the Check Engine Light. It does so by reading and clearing generic, manufacturer-specific and pending engine codes. Provides definitions of DTCs to help in any repair works. Its simplicity makes it become a best Autel obd2 scanner for all users, including beginners. Supports all the basic OBD2 diagnostic functions. The print function doesn’t work despite the manufacturer advertising it as a feature. Lacking when it comes to advanced diagnostic functions like ABS, DPF, BMS and several other services. It is meant for beginners and ordinary car owners. That is why the scanner features the most basic of functions bundled in a compact and affordable gadget. One of the best picks for anybody looking for an affordable and easy-to-use code reader. This device allows you to turn the Check Engine Light off, verify repairs and check the emission monitor status. With plug-and-play capabilities, the AL319 doesn’t need a built-in battery. It gets its power straight from the car’s battery. Meaning the scanner will power up as soon as you connect it to your car. More importantly, it has very handy features that ordinary car owners and beginners can take advantage of. This Autel scanner works on all OBD2 vehicles; both domestic and local. So if your car is a 1996 or newer model then it is almost certainly compatible. That goes for US, European and Asian models. Simple as it is, the Autel AL319 is actually more powerful than you might think. The scanner reads and clear DTCs for most engine problems. Basically, you can use it to check for faults any time the Malfunction Indicator Light (MIL – or check engine light) comes on. Perhaps, more importantly, is the fact that this Autel scanner provides text definitions of codes on its TFT screen. That’s a very handy feature for beginners who may not understand what each code means. Besides that, it displays emissions status (I/M readiness), freeze frame data, reads live PCM and also retrieves vehicle information. Actually, there’s a dedicated key for quickly checking State Emissions. Just one click and the device will do I/M readiness check and drive cycle verification. The AL319 is definitely not one of those fancy scan tools with Wi-Fi and Bluetooth. But it supports USB connection to a PC. That, in turn, makes it easy to update the scanner’s software and allow it to cover the latest car models. Pretty much anybody can use this Autel scanner. Finding its menus is very easy thanks to the TFT color display installed. The whole device only has two operation buttons for retrieving data codes and live data. One of the buttons is dedicated to all I/M readiness tests. Additionally, the Autel AL319 has brightly colored LEDs that come on to show the I/M readiness status. There’s also a built-in speaker that produces audio notifications when the I/M status changes. With dimensions of 4.61 x 2.83 x 0.71 inches, this Autel scanner is very compact. Also, it weighs just one pound, which makes it portable and easy to store. Simple as it is, the Autel AL319 is actually more powerful than you might think. The scanner reads and clear DTCs for most engine problems. Supports one-click I/M readiness status check. Compatible with all OBD2 vehicles. Very simple to use, even for beginners. Comes with free online updates for the product’s lifetime. Just a basic code reader, doesn’t support functions that come with advanced scan tools. For example, you can’t use it for oil reset, EPB, SAS, DPF, BMS, ABS bleeding, TPMS and several other services. Although the AL319 doesn’t support more advanced functions, the people for who it I made don’t really need them. 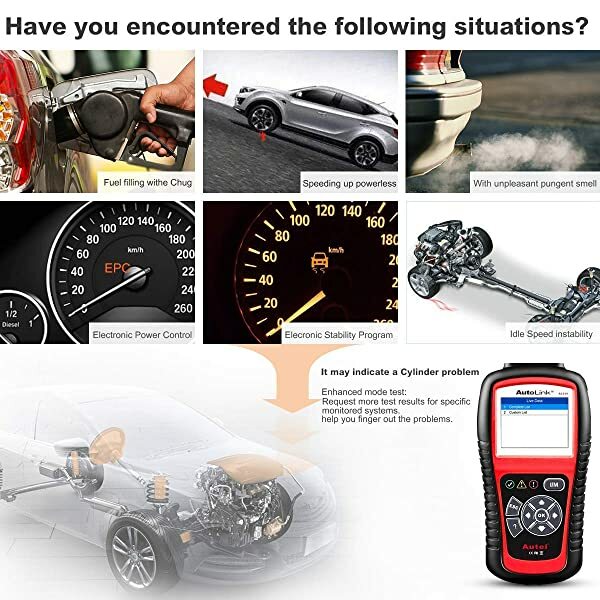 It is meant for ordinary car owners and beginners who just want to determine the cause of the Check Engine Light. Fitted with a quad-core processor, Autel’s MaxiCOM MK808 is a fast and top performing scan tool. It has everything you need in a semi-pro scanner, including wide vehicle coverage, all system diagnosis and a sleek design. 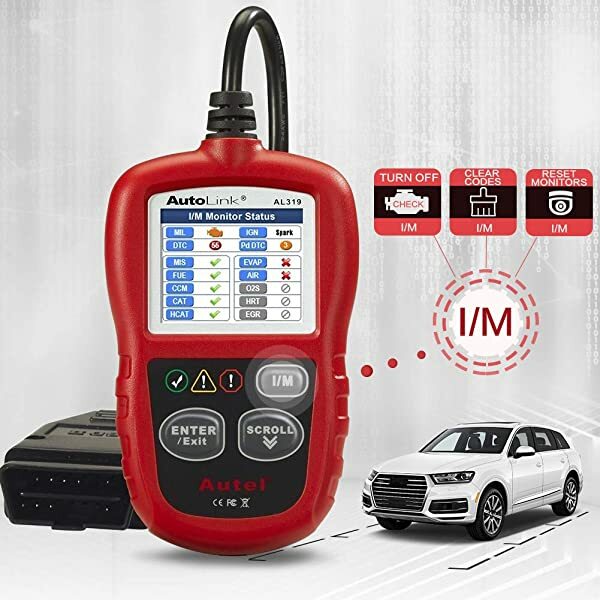 This Autel scanner is compatible with most OBD2 vehicles. More specifically, it works on US-made vehicles manufactured from 1996 as well as EU and Asian vehicles made from 2000. First of all, it can read and clear DTCs on all compatible vehicles. In that process, the scanner provides live data, allowing you to check the health status of systems and parts in real time. Secondly, with it, you get access to all the car’s onboard systems. You can use it to diagnose ABS, brake system, emissions system, engine, fuel system, lights, SRS, and transmission among others. Thirdly, it supports special functions that are typical in high-end scan tools. 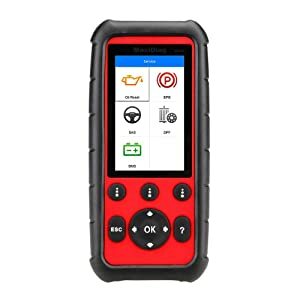 They include oil reset, EPB reset, SAS reset, DPF service, BMS service, ABS bleeding, TPMS service (relearn) and programming of keys (IMMO or anti-theft matching). The built-in Wi-Fi module allows this Autel scan tool to access the internet and update its software. Updating the device allows it to cover the latest vehicle models. The MK808 is not just a top-performer, it is easy on the eyes too. With its tablet-like design, this Autel OBD2 scanner features a 7-inch touchscreen for easy navigation. Plus it is fitted with a lithium polymer battery. That means you can conduct a scan even when the engine is off. Its total weight is just 5.65 pounds. That, coupled with the dimensions of 9.4 x 1.4 x 5.9 inches, makes this device very portable and easy to tuck in the driver’s compartment. Comes with 12-month warranty and 12-month free software updates. Very attractive design and construction. Wide vehicle coverage and supports all OBD2 systems. Supports printing of diagnostic reports and data. Built-in data manager allows you to store diagnostic info for various vehicles. Free software updates only last for one year. After that, you will have to pay $124.5 USD each year for subsequent updates. Who Should Use This Autel Scanner? The MK808 will serve you best if you are a DIY mechanic or an auto enthusiast – the semi-pro folks. 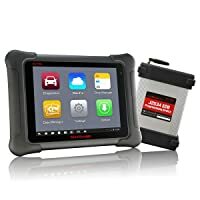 It doesn’t pack the full functions of professional-grade scan tools but it offers just enough for anybody who wants to do more than read and clear codes or run the basic OBD tests. Pros - 24/7 tech support from Autel. - Support basic and advanced diagnostic functions. - Various functions, save you money on unexpected repairs. - Keep your vehicle safe from theft - Has 8-megapixel camera with a flashlight. Cons Probably not affordable to beginners, average car owners.. - Have limited capabilities in modifying vehicles It doesn’t support relearning of certain parts and systems like TPM sensors. But it does test them. You definitely need a scan tool with wide coverage (possibly OBD1 and OBD2 compatibility). Plus it should have comprehensive functionality that includes all OBD2 diagnoses, tests and resets (relearn). A few extra features like wireless connectivity wouldn’t hurt. The two that I have outlined fit the bill. The biggest consideration is price vs. features offered. You don’t need a highly complex scan tool that has more functions than you need. 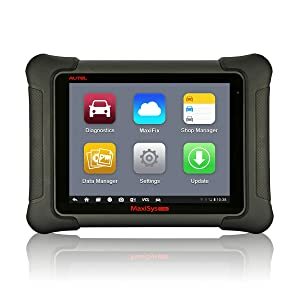 Ideally, you want one that can read and clear codes, perform tests for basic systems (like airbag, ABS and transmission) and offer a few bonus functions like key coding. The two above seem a perfect fit for that. If you fall in this category you should be looking at usability and affordability. Rather than buying a tool you can’t navigate, go for one that has a simple menu and the most basic OBD functions. Just diagnosing the engine is enough. It will enable you to turn off the Check Engine Light. The five Autel scan tools that I have suggested are great for that. For professionals particularly those who work on heavy-duty vehicles like trucks, buses, and vans.